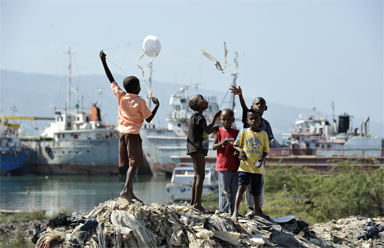 Boys fly kites in a Port-au-Prince neighborhood days after the January 12 earthquake that ravaged the Caribbean island nation. Photo by Paul Jeffrey/ACT Alliance. GENEVA, SWITZERLAND — Slowly food and water have started moving in Haiti. Aid workers have been struggling day and night to distribute goods and relief materials, as Haitians use their imagination and initiative to create new lives for themselves. Commercial activity is slowly recovering as an increasing number of vendors return to the streets of Haiti’s earthquake-devastated capital, Port-au-Prince. The streets are still full of rubble. Women try to clean up so, sometimes needing to hold cloths to their faces to mask the smell of decomposing bodies. The ACT Alliance, through which Canadian Lutheran World Relief is working, has set up tented camps in a soccer stadium in the Santa Teresa area of Petionville, offering shelter for the homeless population. There, ACT photographer Paul Jeffrey found Haitians in full swing, building makeshift homes, doing so with humour and surrounded by the comings and goings of family life. They have given the narrow passages between their shelters names on pieces of cardboard nailed to temporary homes. In these communities, they try to carry out their daily chores. Water is a scarce commodity in Port-au-Prince. ACT has delivered a 10,000 litre water bladder to a makeshift tent city at a partially-destroyed school in the Pean district of Port-au-Prince. A portable water system for the homeless families has also been set up and operates alongside an exisiting rainwater harvesting system. Although the school was partially destroyed, the system was able to be repaired by ACT personnel. ACT Alliance – Action by Churches Together is a global alliance of churches and related agencies working together for positive and sustainable change in the lives of people affected by emergencies, poverty and injustice through coordinated and effective humanitarian, development and advocacy work.